On February 6 2018 we marked 100 years since the first Act passed in Parliament granting women the right to vote in the UK. This year the Autumn Study Day is planned to coincide with the National Trust's celebration of the centenary of the Representation of the People Act (1918) which granted the right to vote in parliamentary elections to all men over 21 and women over 30, subject to certain qualifications. Killerton is a National Trust countryside estate in Devon, 7 miles North of the lively city of Exeter and easily reached by car or a combination of public transport. This year Killerton offers a brand new installation as part of the Women and Power programme. Votes for Women? features the story of two generations of the Acland family who were connected with the Killerton estate: Gertrude Acland who supported the Anti-suffrage League, and her nephew's wife, Eleanor Acland, a Liberal suffragist. 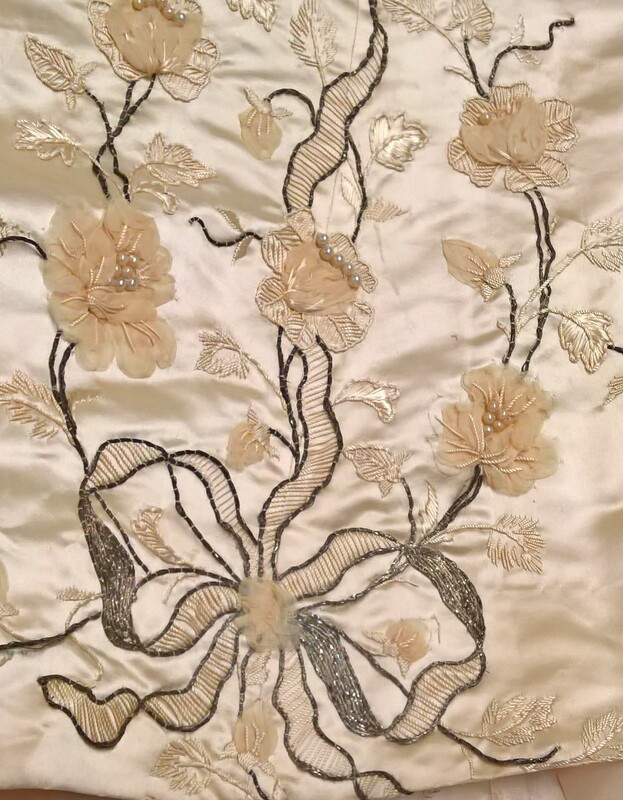 The annual fashion exhibition drawn from the Killerton dress collection will mirror the timeline of the campaign for women's suffrage. Highlights include a walking dress worn by Queen Victoria ( anti-suffrage), a gown by Nicaud of Paris made for Eleanor's 1905 wedding, and the 'parliamentary suit' worn by Nancy Astor when she became the first woman elected to Parliament to take up her seat in the House of Commons (1919), as well as WSPU (suffragette) memorabilia and dress of the period. There will also be a touring exhibition from the National Portrait Gallery. Faces of Change features paintings of important figures associated with the long journey towards the Vote. The theme of the Study Day will be dress and politics in the broadest sense. There will be an opportunity to attend talks linked to the theme during the morning, with a chance to view all three exhibitions and take a closer look at some objects from the stored collections. This is an opportunity to see behind the scenes and view some of Queen Victoria's clothing in the costume department's workroom. The full programme will be confirmed in due course. Professor Angela K.Smith (University of Plymouth) will speak on WWI and the suffrage movement, giving an overview on women's roles during this pivotal moment in history. Dr Becky Munford is Reader in English Literature at the University of Cardiff, she will introduce us to her project with the university's Library and Archive 'Women in Trousers'. Amy Towle is Assistant Exhibitions Officer at Cosprop. She will speak about the W.S.P.U. and the politicisation of dress. the study day will include a guided tour of the fashion exhibition; a full outline of the day to be announced shortly. Fashion, Femininity and Power AUTUMN STUDY DAY, KILLERTON, BROADCLYST, EXETER Saturday 15 September 2018 The Costume Society’s annual autumn study day this year will take place at Killerton, the National Trust house near Exeter. The theme will link in with the National Trust’s headline programme for 2018, Women and Power, to mark the centenary of the granting of the first voting rights to women, and take a broad view of dress and politics. There will be an opportunity to attend talks linked to the theme in the morning, and in the afternoon a chance to view the three exhibitions in the public spaces in the mansion, and take a closer look at some objects from the stored collections. The behind-the-scenes tour will include a view of some of Queen Victoria’s clothing in the Costume Department’s workroom. The morning talks will be held in the Heartspace, which is located at the back of the mansion. On arrival please wait in the entrance hall where you will be met by a volunteer who will show you to the meeting room. PROGRAMME 10.00 Welcome and Housekeeping 10.15 Professor Angela Smith, University of Plymouth: World War 1 and the Suffrage Movement 11.00 Dr Becky Munford, Reader in English Literature, Cardiff University: Women in Trousers, a Visual Archive 11.40 Coffee 11.55 Amy Towle, Assistant Exhibitions Officer, Cosprop: WSPU and the Politicisation of Dress 12.20 Break for Lunch 14.00 Behind-the-scenes tours alternating with exhibition tours. - 16.00 PARKING: Please use the visitor car park. The mansion is a short walk along the drive. There is a small parking charge for non-members of the National Trust. ADMISSION: Admission to the house is not included in the booking fee. This is free for members of the National Trust and their guests. There will be an admission charge for non-NT members. REFRESHMENTS will be provided mid-morning. Lunch is not provided, please make your own arrangements. There is a restaurant on site and two cafes for snacks and sandwiches. If bringing your own there are picnic tables around the property and indoor cover if wet. Venue: Killerton House, Broadclyst, Exeter, Devon EX5 3LE Date: Saturday 15 September 2018. 10.00 – 16.00 Tickets: Members: £30.00, Non-members: £40.00, Student members: £5.00, Student non-members: £10.00. Entrance to house and parking free for National Trust members; there is a charge of £11.60 (house) and £2.00 (parking) for non-members. Booking: Costume Society Bookings, 12 Red Square, Piano Lane, Carysfort Road, London N16 9AW or via the website. There is also a booking form in the newsletter. Book now via Eventbrite by clicking on the booking link above. NB Admission to the exhibitions at Killerton is free to members of the National Trust, but non-members will have to pay an admission fee to the property which includes entry to the house, park and garden. There is a small extra charge for the car park. 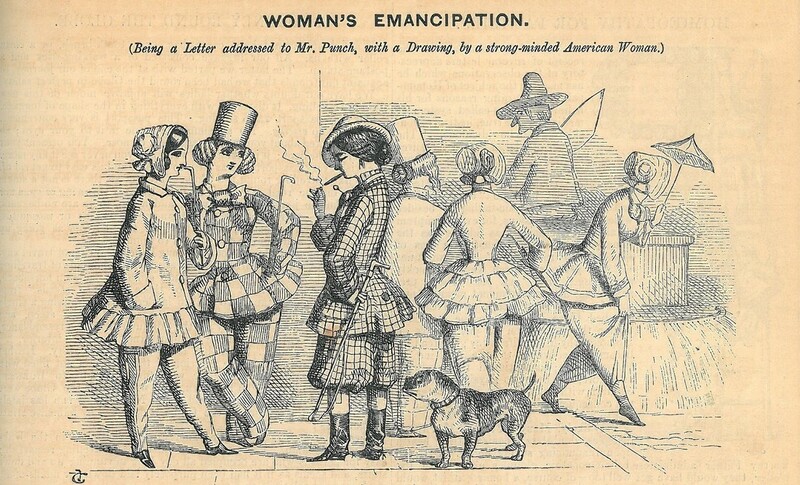 John Tenniel, ‘Woman’s Emancipation by a strong-minded American Woman’,Punch, 1851. Special Collections and Archives, Cardiff University.